In March 2006 we moved into our purpose built 4,000sq ft showrooms, offices, and our 16,000sq ft warehouse. There are ample car parking facilities on location where you can park safely and securely. 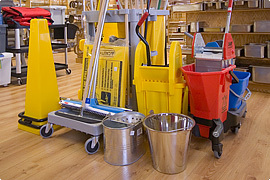 Our showroom is fully wheelchair accessible, as is our fitting room and toilet facilities. Our friendly sales team will be on hand to welcome you to our showrooms where you will be welcome to a refreshing cup of coffee/tea before you ramble around our brightly lit, air conditioned, showrooms wide aisles, at your own pace. 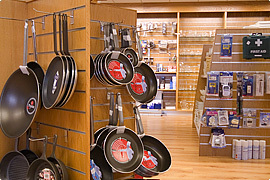 Our on location sales team will be on hand to welcome you and answer any questions or help with any advice you may need during your visit, they will guide you through our vast range of crockery and cutlery styles, most of which are kept in stock in our warehouse and can be brought home with you after your visit. Our telesales service is also located in our showroom and is open Monday to Friday 9.30am to 5.30pm we are now open throughout lunch. 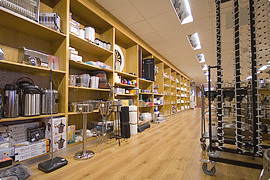 You can view our vast range of products for all your requirements including catering, hygiene, cookware, cleaning, delph, cutlery, chef’s knives and uniforms, these you can try on in our showrooms purpose built fitting room. 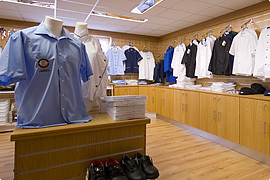 While in our uniform department you can match up your uniform with chef trousers, jackets, a wide variety of coloured and different styled aprons and a selection of headwear and footwear all on display and can be tried on and viewed while here on location. Also available is our embroidery service where you can customise your uniform to suit your own company’s brand or logo. 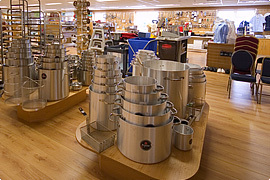 Throughout our fully stocked showroom you can view a complete range of kitchen utensils and catering equipment to fully stock your kitchen, restaurant or catering business. On location in store is our discount section where many items are reduced to clear, some great bargains and savings can be availed of here during your visit. Every month, a large selection of products are reduced in price, full details of these are on view in our showroom or contact one or our team for further details. Frequently we launch exciting new products and details of these innovations in the catering and hygiene trade are available to see in our showroom and our sales team can introduce you to these on location. Demonstrations can be made on site by appointment these are extremely advantageous when purchasing Robot coupe food processors, electric Moulin’s, hand dryers, chemical cleaning systems, toilet paper and hand towel systems. After viewing how these catering products work you will see how exactly they will benefit your business. A private conference room is located in our showroom and is available to sit down and discuss in detail plans for your business in a warm friendly environment, over a cup of coffee, with your dedicated salesperson. Please ring in advance to make sure the sales representative is available on your arrival.